ByteVis is a standalone program that lets you turn the bytes in any file into a visualization. Sometimes you don't want to sift through a file in a hex editor to look for certain byte patterns, e.g. ASCII codes or just where a certain block of code starts and ends. Wouldn't it be nice to turn it into a picture and see the file at one glance? Yes. That would be nice. …or keep the default LUT. Set the size and shape of each visualized byte in the "Block Appearance" group. Set a desired row length by pasting a numper or hitting the "* 2" and "/ 2" buttons. Click "Visualize!". Once the process is complete, ByteVis will ask you for a filename to save. ByteVis launches with a console that keeps you in the loop of what's going on, how long stuff is taking, which file is loaded, etc. Files up to 1,024,000,000 bytes in size are supported. Setting the LUT colors manually overrides a LUT loaded from file and vice versa. The LUT you see in the preview is always the one that's being used. Circles look best with an odd number block size pixels. If the resulting image excees 32,000px in either dimension, the "Visualize!" button will be greyed out. 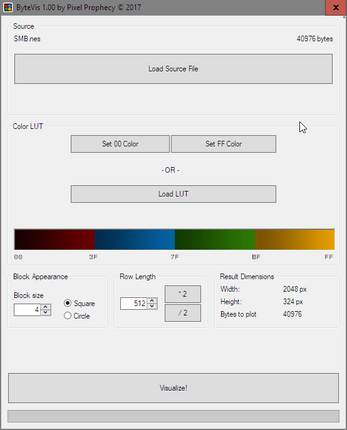 Select a different row-length then and/or decrease the block size. 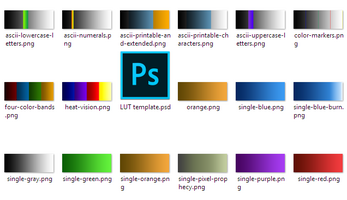 You can load any PNG file to be used as look-up table. The first 256 pixels will be mapped as the corresponding byte values. If you want to make your own LUTs, just edit the PNG files that come with ByteVis, or open the provided Photoshop template to your liking, then save the result as a PNG image. Q: Help: When trying to enter a value for "Block size" or "Row Length" the digits get added from right to left! A: That's because after each input the value gets sanitized so that you can't enter letters or punctuation. Use ↑ and ↓ on your keyboard to change the value or paste a value. Q: I'm visualizing a large file and the progress bar suddenly stopped and the program isn't responding. What should I do? A: That's okay. Just wait a little longer. When the plotting of the image is done, the console will tell you how long the process took and will open the "Save as" file dialog. Be aware that saving the resulting PNG might take longer than the visualization itself! Q: What files are supported? A: As source file, literally any file. Start with small files (a few kb) before visualizing a big one. As for look-up tables, only PNG files are supported. The resulting visualizations can be saved as PNG files with transparency. A: In the current version this is not yet possible. With each new start, the program will launch with its default settings.